Y’all remember baseball season? Yeah, me neither. I hadn’t really thought about baseball for weeks until one day in late September, when I opened up Google Reader and saw that Burgh Baby had picked out the contest winners for her season-long Make Room for Crazy battle with Ginny. Don’t remember the details of that one? It was simple — if you thought that the Pirates had a shot at eclipsing the .500 mark this season, you sided with Ginny; if you thought that 2010 would be another season of futility at PNC Park, you sided with Michelle. Your vote cost $5, with the money going to Ginny’s Make Room for Kids and Michelle’s Christmas Crazy fundraisers. And no — no haunted houses or princess dresses were involved. I’d love to see winning baseball down the street from our house as much as anyone, but as I said in the comments on Michelle’s initial post — this wasn’t the year, next year isn’t the year and it won’t be the year until someone named Lemieux or Cuban owns the team. The bonus for us contestants? Each of the ladies lined up donated prizes,which would be awarded at random to the folks who picked the winning side. 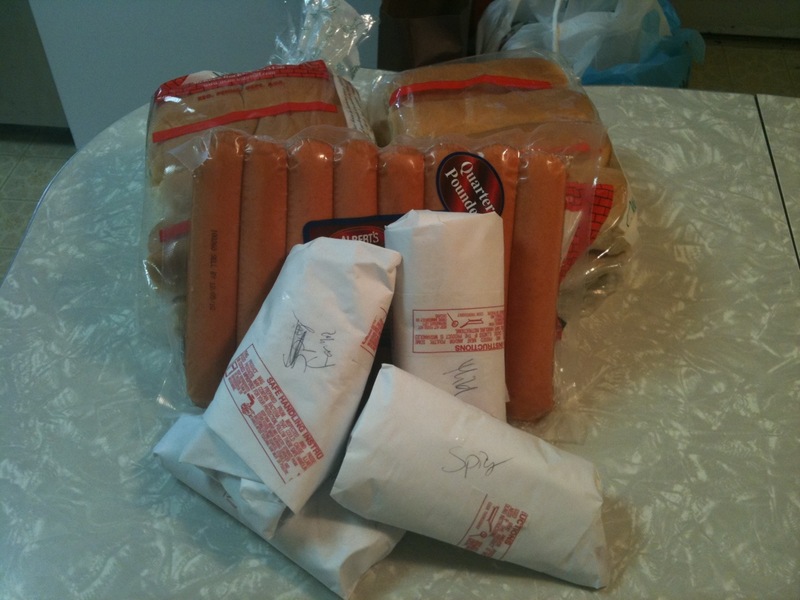 There was meat — specifically, sausage from Parma Sausage in the Strip, ridiculously delicious-looking half-pound hot dogs and Mancini buns. And then we had fixin’s for s’mores. 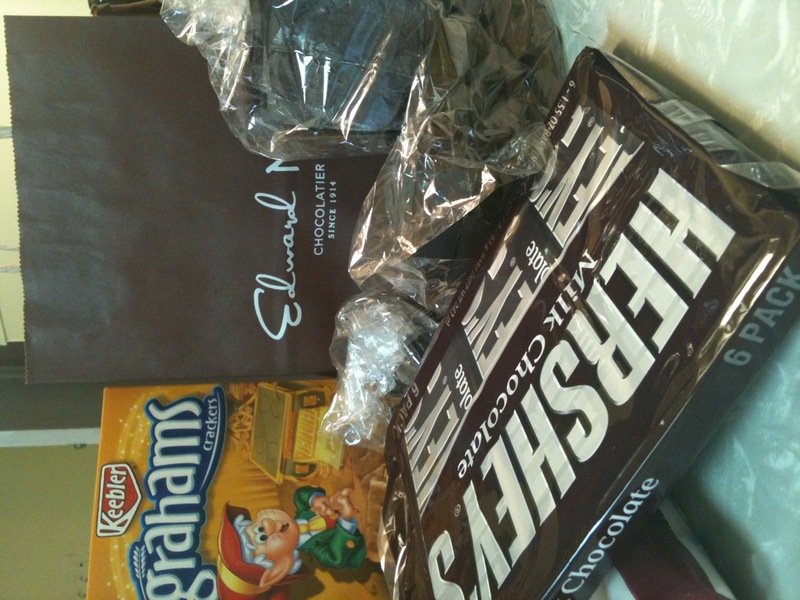 This included the basics — a big pack of Hershey bars and a box of graham crackers — and, in a bag from Edward Marc Chocolatier on Carson Street, chocolate-covered marshmallows, chocolate-covered graham crackers and these 17-pound chunks of dark and milk chocolate. So, yeah — sausage and chocolate. I am a happy boy. And the folks who join us for the Killer Nuts Tailgating parties are sure to be happy with the spoils as well. Thanks to Andy — a great guy who we need to get out to some tweetups so you all can meet him too — for his generosity. And thanks to Ginny and Michelle — again — for making raising money for kids so much fun. Isn’t Andy the bestest? He’s so nice that I let him live after he told me that I looked like crap the first time we met. Except he didn’t say “crap.” Heh. Have fun roasting the nom noms over the fiery Pirates bandwagon! Thank you for the kind words. It was actually a lot of fun for me to put together. I hope you and your fellow tailgaters enjoy it. Hope to see you and Michelle and her infinite forgiveness all very soon. Previous PostPrevious 10. dull boy. Next PostNext 12. forty four.